I caught up recently with an old colleague. We’ve never worked in the same organisation, but we’ve been brought together several times over the last few years to achieve the same purpose — helping the amazing, vibrant talent in South Auckland reach its full potential. We talked about the hard yards of working within complex systems to achieve change focused on the needs of kids and whānau. And we talked about how hard it can be to collaborate. This is very topical right now, as the new Government has set very high expectations on how we need to work in active partnership to achieve meaningful change. This woman and I like each other, and our relationship has always been warm, collegial and respectful. But sometimes the work we’ve done together has been hard because we’ve been working for different ‘sides’. We laughed about this, about how this was a construct put on and around us by others, rather than something of our own making. And she directed me to a book. 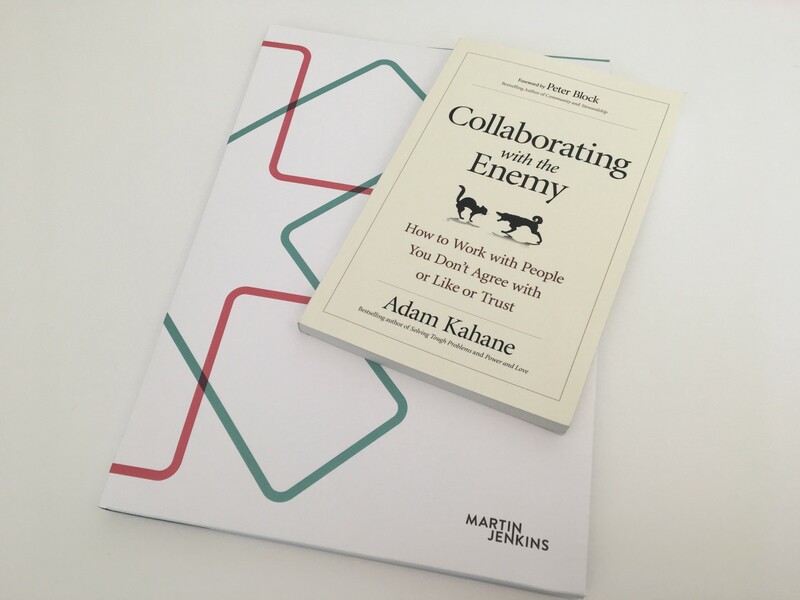 Adam Kahane’s Collaborating with the enemy — How to work with people you don’t agree with or like or trust is a must-read for anyone trying to innovate and collaborate to achieve collective impact or systemic change. Informed by Kahane’s experience as an international peace negotiator, the book’s central premise is that assumptions around conventional collaboration are all wrong. The usual conception of creating a process where people come to be ‘on the same team’ and head in the same direction is falsely based on control. Kahane argues instead that when we’re working in complex situations and with diverse others, collaboration can’t be controlled — and doesn’t need to be. Kahane, a Canadian, advocates giving up ‘unrealistic fantasies of harmony, certainty, and compliance, and embrac[ing] messy realities of discord, trial and error’. He advises us to accept conflict, and to bring a mindset of systematic experimentation as well as an openness to changing our own objectives. He also recommends thinking in terms of the intent of the collaboration, rather than a less realistic, less flexible conception of ‘shared goals’. Kahane’s thesis reminds me of the co-design method of prototype, test and iterate, which my colleague Nicola Halliday talked about recently in her Design thinking — Silver bullet or white whale?. Kahane encourages ‘stretch collaboration’ where you take a step forward, observe what happens, and then take another step. This is all at odds with the ‘enemification’ of more conventional collaboration in times of conflict. The book is a fascinating read — not least because the experiences that have informed Kahane’s view have been watershed moments in the resolution of international conflict. On the other hand, I’m a little sceptical about whether a framework capable of leading to world peace is always necessary if we just want to get some stuff done in a better way together. Kahane himself is both articulate and direct in his communication style. By comparison, the collaborative processes I’ve been involved in have usually featured humility and passive aggression in almost equal measure, as we stumble around not being able to clearly express our feelings. But Kahane gives permission to express what many of us have felt in those situations — that sometimes collaboration is just plain hard work. How do you do collaboration? Last year the Department of the Prime Minister and Cabinet hosted a presentation by Professor Mark Moore from Harvard’s John F Kennedy School of Government. Prof Moore reminded leaders across the public sector of the importance of legitimacy and support in achieving strategic action. Those are the necessary preconditions — but how do you actually do it? At MartinJenkins we spend a significant amount of time supporting organisations who are doing joint work. Often we are working across a whole sector, or several sectors, where multiple participants are trying to achieve a similar outcome or common goal. At its best, this work has seen whole sectors of New Zealand society galvanised around a shared view for how they could make the country a better place. Through this work we’ve gained some insights into what we think is the secret sauce that makes collaboration work. Interestingly, we think the key elements are also part of what has some agencies thriving with matrix management structures, while others struggle with transactional relationships and complaints about weak or diluted accountability. First, I find people consistently underestimate how deliberately you have to work in order to collaborate successfully — you have to keep putting your back into it. You also have to set aside a devotion to your own gains and contemplate or be imaginative about the goals of others. Let’s be honest — some individuals just aren’t cut out for this, as their innate nature is to hoard information and power, or they lack the insight to realise they’re acting in an overtly self-interested way. By contrast, others just need to have their resolve bolstered in times when the risk is heightened. That’s particularly likely if there is any threat to job security, as identified in a recent Harvard study that found collaboration was harder in hard economic times. Building some structure around the collaboration can help keep the group on track towards the intent of the collaboration. Structure you can borrow from various methods, including co-design and collective impact. Having a third party involved can also be helpful — they can remind everyone of the original objectives and hold people to account against them, or they can help iron out differences or lead the group in accepting them. You also need to pick the right team. And then back them. Don’t second your worst performers into another organisation or team in the hope that they’ll leave. If you’ve got a highly complex situation requiring successful collaboration, send in your best people, the ones with the right mindsets for collaboration. Fairness and honesty as a pathway to trust. Adam Kahane’s book reminds us of something we often forget — collaboration can’t be controlled because people can’t be controlled, and if you go into a collaborative process with a fixed mindset you will fail. The ground may shift while you’re working together, perhaps because the ground is shifting for participants back home as their mandate or constituency shifts. You may find that the different organisations’ objectives are all aligned at the outset, but that they evolve and diverge as the work goes on. The trick is to invest in understanding your partners — and keep investing. Kahane’s book is a good read on how to partner more constructively with people in low trust environments. But I’m encouraged that in my experience most people approach collaboration with a generous disposition. That dose of empathy and insight right at the outset is always the best start. Please give this article a clap, email MartinJenkins at admin@martinjenkins.co.nz and follow us on LinkedIn and Twitter.